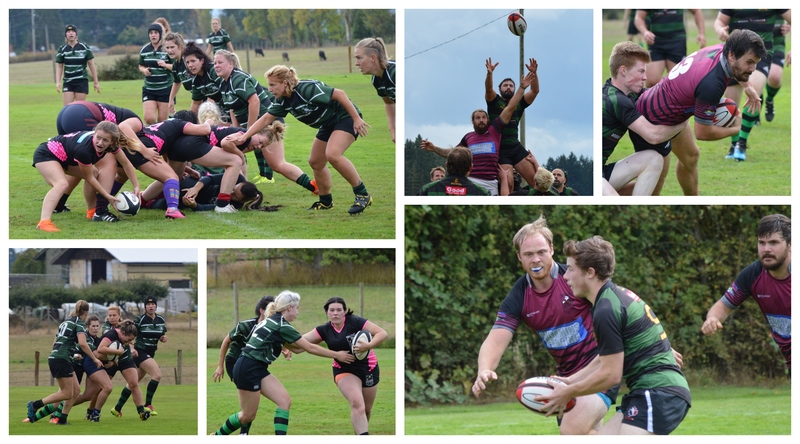 This past Saturday saw a rare rugby doubleheader where both the Comox Valley Kickers Women’s and Men’s teams travelled to the Cowichan Valley to face off against the Cowichan Piggies. The Comox Valley Women’s team harnessed the momentum from last week’s victory and put up points early and often. Paula Simpson (2), Natalie Nguyen (2), Daris Tendler (2), Karli MacFarlane and Keely Orrick scored tries with Paula making 6 out of 8 conversions for a 52 -27 win. “It was a very physical, hard hitting game. Cowichan scored the first points and we knew we had to answer back right away. We scored our points from our back line utilizing the field and running hard lines while our forward pack dominated the scrums and crashed the ball well,” said loosehead prop Jenn Lund. In their first game of the season, the Comox Valley Men’s team found themselves playing defense more often then attacking downfield. “We have many players who are new to rugby or who are returning to rugby after an extended absence. When we had the ball, we were able to progress down the field and challenge the goal line but at the end of the day, the opposing team was quicker and more experienced. With more practices under our belt, I believe that we will improve steadily and put more points on the board,” said team captain, Jesse Ramsay. Devon Moore, Number 8, scored the only try for the Kickers which is most fitting as he was celebrating his 22nd birthday at the game. The try was followed by a successful conversion. The final score was 39- 7 for Cowichan. Please join the Comox Valley Kickers at the Prime Chophouse and Wine Bar this Wednesday, September 19th from 5PM - 9PM for our first fundraiser of the season. Enjoy a beer and burger with part of the proceeds going to the club, as well as, bid on some awesome silent auction items. Thank you for everyone who donated. Hope to see you there!